Paper up to 8 1/2" x 11"
Side 1 printed with four-color process and 1 foil stamped area. 14pt C1S Semi-Gloss stock coated with Aqueous Soft-Touch. 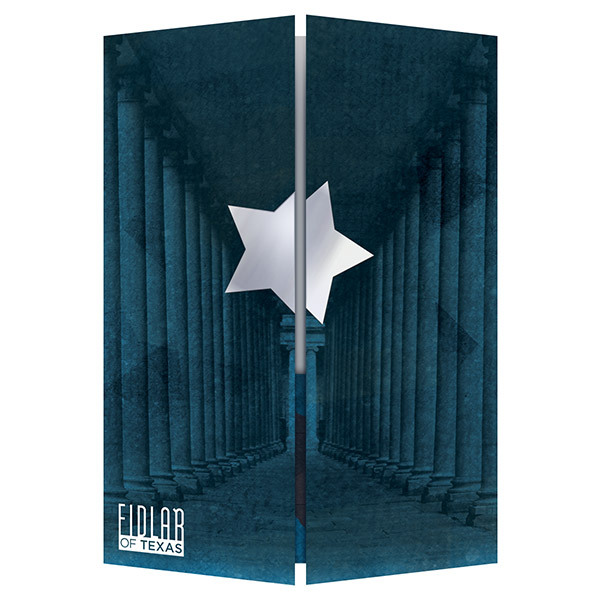 Fidlar Technologies pays homage to its home state's flag with a Metallic Silver foil star stamped onto a patriotic blue background. Two rows of stately columns give the company a sense of establishment and lead the viewer to the center of the gatefold cover. 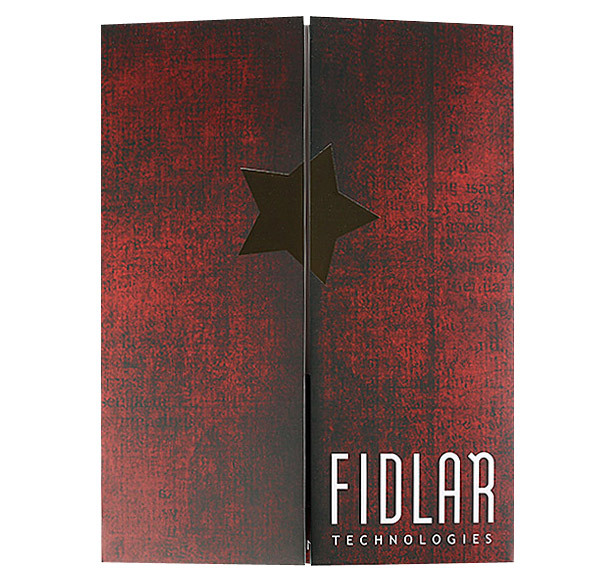 Inside, both the right and left gatefold flaps provide more information about Fidlar's record management services. An image of Texas on the center pocket reinforces the brand’s loyalty to local customers. One last tribute to the Lone Star state appears on the back cover: a red star overlaps a second set of columns that seem to move toward the viewer, completing the user's experience. Side 1 printed with four-color process and 1 foil stamped area. 14pt C1S Semi-Gloss stock coated with Aqueous Soft-Touch. H4 business card slits on center pocket. Texas company Fidlar Technologies shows off its state pride with this rustic design. A star stamped in Metallic Gold foil spans both sides of the gatefold cover, which opens from the center—saloon door style. The red panels have a weathered effect like an old barn's paint. What look like two sticky notes inside are actually product and service lists imprinted directly onto the flaps. The center pocket shows the brand's pride in its 150+ year history. On the back cover, Fidlar's contact information and logo complete the design. Side 1 printed with four-color process and 2 foil stamped areas. Side 2 printed with four-color process. 130lb C2S White Dull stock coated with Aqueous Matte. H1 business card slits on center pocket. 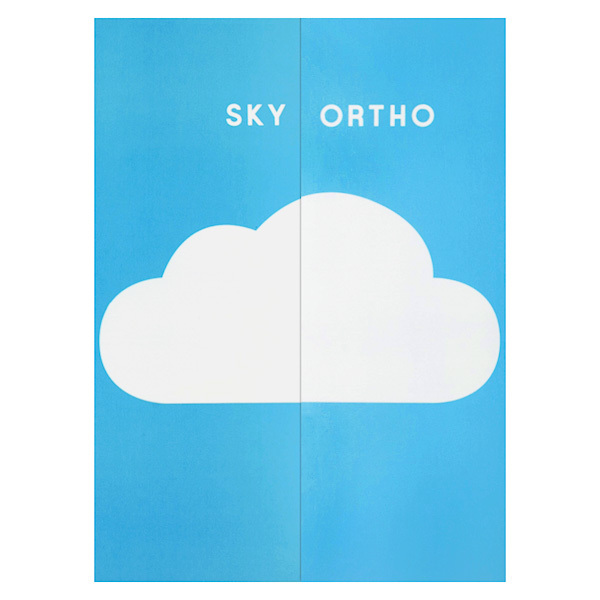 Sky Ortho used two imprint methods and cute images to create a cool, fun design. A fluffy white cloud on the cover speaks to the dental office's name. A colorful interior adds a kid-friendly feel, since Sky Ortho specializes in working with children. Brand and dental health info appear on the two narrow flaps. On the back, illustrated teeth portray situations that warrant a trip to the orthodontist. An icon at the bottom lets patients download the brand's app to learn more about its services. Four-color process printed on Side 1 of 14pt C1S White Semi-Gloss stock. Coated with Aqueous Matte. 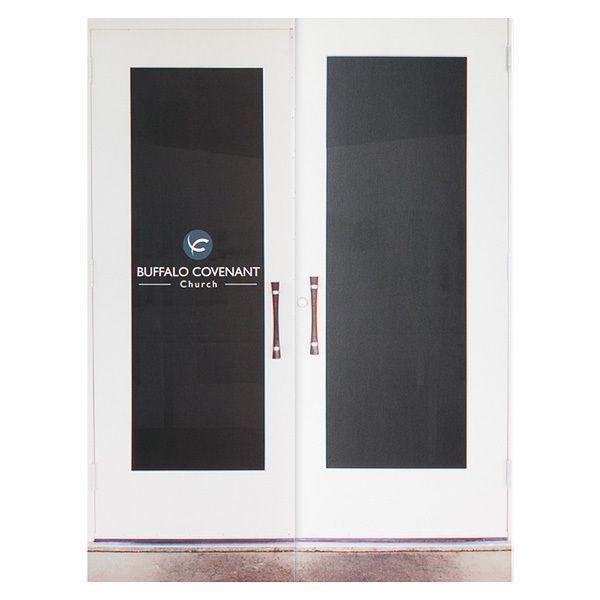 This gatefold cover is printed to look exactly like Buffalo Covenant Church’s doors, complete with the brand logo applied to the window at left. This creates the illusion of walking into the church when recipients open the cover. Inside, teal pockets look modern yet welcoming. The back cover carries on this color branding; a red banner at the bottom highlights the logo and contact info with a bright pop of color. Two slim panels swing open like old-timey saloon doors for an entertaining, interactive experience. The left and right pockets hold 3 11/16" x 8 1/2" brochures or rack cards, while an unglued center pocket gives quick and easy access to its 8 1/2" x 11" contents. With two different sized storage areas, this product works well for presenting multiple types of print collateral. Its tri-panel layout is also brimming with design options, such as dual cover designs or a continuous design throughout. Right Pocket: 4 1/2" x 4 1/4" v-split pocket, glued at outside edge. Acceptable Insert Sizes: up to 8 1/2" x 11"